The typical New Zealand household and lifestyle is not anywhere near as 'clean and green' or "100% Pure" as photos of our wonderful remote landscapes might first suggest to tourists, or to purchasers of exported farm produce! You'd probably like to be Keeping it Pure, however, and agree that New Zealanders need to walk the talk on sustainability? Internationally, sustainability issues include a fast-expanding and resource-hungry human population, fossil-fuel burning that accelerates global warming, the imminent peak in cheap oil production (when total demand exceeds easily-affordable supply) and persistent pollutant chemicals and plastics being spread globally in air and oceans. Humans are displacing other life on the planet, speeding extinction of many species, including here in New Zealand. We know that our NZ 'footprint' of per-person impact on resources and nature is similar to that in USA, to Canada and rich areas of Europe, and that it is much higher per person than in developing countries of Asia and Africa. If all humans on earth lived as we do we would need several planets, but there's only one available to share. You might have seen Keeping it Pure on Prime TV, or Franny Armstrong's film The Age of Stupid or Al Gore's An Inconvenient Truth (and its 2017 sequel), Leonardo diCaprio's The 11th Hour, the BBC movie Earth or perhaps Home directed by Yann Arthus-Bertrand? Others have been the cartoon Wall-E, the global documentary Planetary, agricultural critique Food Inc, the film FLOW- for love of water, another on food growing titled Dirt and the climate activism shown in Disobedience or the recent two part Al Jezeera Polluted Paradise documentary on rivers in NZ . In 2018 there is Living the Change which features some NZ examples. In response to the challenging global picture, you'd want to know first what the top issues are in NZ and then how you can do your bit towards creating sustainability. Sustainable Living Education Trust can help you with accurate, independent information. 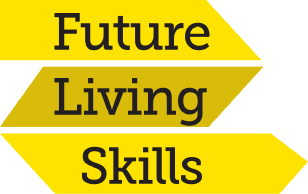 We know that change is possible and necessary, so our 'Future Living Skills' should be well-informed. On this page, we brief you on some of the relevant issues for NZ households and provide you with a series of useful links from this local-government-backed not-for-profit Trust. The downloadable learning guides (password accessed) explain why action at home is a really good start and dies add up to significant difference. Our free action page and registering to get access to learning guides/courses will take you on to the next practical steps. Good to meet you. We're updating our background reader about sustainability in New Zealand - republished here soon. A four page summary of the IPCC Fifth climate assessment for New Zealand, 2014 is available as PDF here. We first had $2 a litre petrol in 2008, then a fall because of global recession, then fuel prices went up ($2.20 per litre) and moved down and back up to $2.05 by January 2017, despite level global demand. The world is at or near aggregate 'Peak Cheap Oil' production, globally, after which prices could rise steeply. It was the higher prices that are driving use of fracking to extract oil and gas under land (especially in North America and UK, but also in Taranaki NZ) and also deep sea exploration such as around NZ, because the easy, cheaper land-based oil sources have been tapped and many are now past their peak production. Decide what carbon emissions you want to measure in your household, see our guide to using the free carboNZero calculator. If you measure your impact now, you can more easily track your changes later! Maybe set a target for reduction? We often miss chances to share our car travel or use buses, and our increasingly heavy human bodies lack the healthy exercise that we could get from walking or cycling, instead of driving, especially on shorter journeys. Cars may seem convenient by habit, but are expensive, hazardous, noisy and polluting, too. Why do we use them for short trips in town? As NZ approaches the limits of acceptable hydro-power generation from big river dams and the Maui gas-field supply runs low, we are turning to clean geothermal, wind-power, tidal or wave power, and to photo-voltaics (PV) and solar water heating. But we still use other fossil fuel energy sources that release carbon to the atmosphere (such as coal at Huntly Power Station and coal in Fonterra milk powder factories), contributing to global warming. Energy efficiency is becoming a crucial public issue in NZ, so the recent 'warm Up NZ' programme to subsidise house insulation for healthier homes, was one welcome response, also bringing health benefits. Interest is growing in electric vehicles too, although the energy involved in making them is still 50% of the total energy required in the vehicle's lifetime, whatever its 'fuel' type. In homes, we burn coal, damp wood and fuel oil, rather inefficiently, to heat our poorly-insulated living spaces, whilst creating unhealthy smog for some areas in the winter. Older houses are damp and cold, often mouldy - hazardous for the elderly and asthmatics. We waste renewable hydro-electricity by not wrapping hot water tanks and not insulating the ceilings of heated rooms. We waste power by using inefficient filament light-bulbs instead of compact fluorescents or LEDs and by leaving equipment such as TVs and microwave cookers waiting on 'stand-by' overnight. Read more in our background information on electricity and energy use at home. Over 40% of typical household rubbish bag or wheelie-bin contents could have been composted, and an additional 30% reclaimed as useful materials - including metals, paper, card, plastic codes 1 & 2. Many households do not recycle as much as they could, and the council-run landfills are growing deeper and costlier. Rubbish doesn't "go away" after it leaves our kerb-side, it is just expensively relocated by truck! 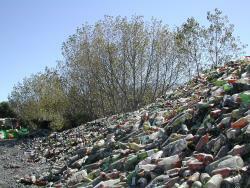 Open tips on farmland are now rare (photo shows a rural district's pile of glass bottles stockpiled, until recycling prices rose) but the modern engineered landfill sites are very expensive to build and maintain, as they have to contain toxic liquid leachate from below and the methane gas emissions to air created by decomposition of food and garden materials without oxygen. Methane is a more-damaging 'greenhouse gas' per molecule than carbon dioxide. Read our background information on waste issues at home. Also read background information on shopping impacts and choices. ISSUE: We are under-using town & city gardens. Grow more veges! We buy prepared foods in packaging material that's often not recyclable; and don't grow much fresh fruit and veges for ourselves. Many young people do not know how to garden, or make compost, to preserve surplus crops or even how to cook fresh food (but it's never too late to start enjoying this). 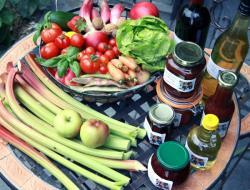 Organic gardening is becoming popular, and features in our learning guides. Read background information on what makes for more-sustainable gardens to help assess your own backyard space. Exciting urban community food growing stories from Christchurch and from the Hutt Valley. A Southland food forest. Toilet cisterns without a 'dual-flush' waste precious fresh water (10 litres per flush), as does frequent lawn watering in hot summers. Clean drinking water, as a precious resource, is a major focus of environmental education effort internationally. At home, we may spray poisons to kill unwanted insects and lawn weeds, and put bleach down the toilet - when there are safer and cheaper alternatives available. Car washing with detergent in the street and water-blasting of paths and sealed drives sends pollution through the storm-drains into streams. Let's keep urban streams clean and bring back their wildlife. 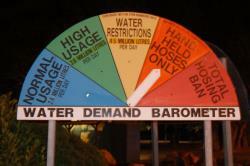 Read information on issues of using and protecting water at home. Ready to move from contemplating issues to taking action? Learn some living skills for your and the Planet's future- see our first Action pages now.